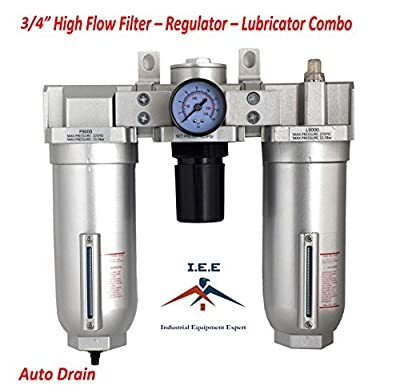 3/4" HEAVY DUTY HIGH FLOW COMBINATION FILTER REGULATOR LUBRICATOR AIR LINE PARTICULATE FILTER MOISTURE TRAP LUBRICATOR OILER REGULATOR CLEAN AIR TOOLS AUTO Drain! 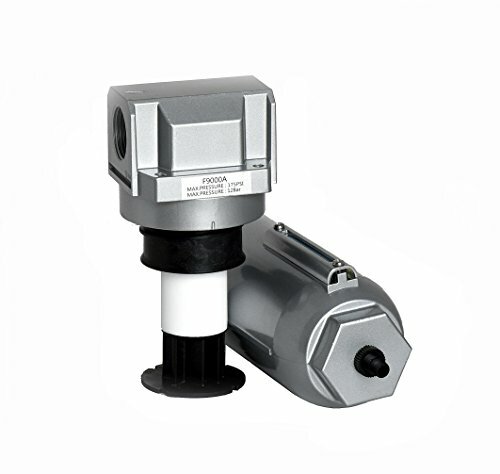 Product prices and availability are accurate as of 2019-04-24 01:13:23 EDT and are subject to change. Any price and availability information displayed on http://www.amazon.com/ at the time of purchase will apply to the purchase of this product. H/D HIGH FLOW 3/4" COMBINATION FILTER-REGULATOR-LUBRICATOR W/ GAUGE FILTER: 300 PSI MAX - 5 MICRON FILTER - 2.7oz METAL BOWL CAPACITY - VISUAL SIGHT GLASS REGULATOR: 7 - 225 ADJUSTMENT PRESSURE - 300 PSI MAX LUBRICATOR:OIL FILL ADJUSTMENT TO REGULATE OIL FLOW - 5.1oz OIL CAPASITY - SIGHT GLASS Auto Drain!!!!!!!!!! !